﻿ Real Madrid 5-0 Sevilla. A demolition job like the old times! 09.12.2017 » Real Madrid 5-0 Sevilla. A demolition job like the old times! 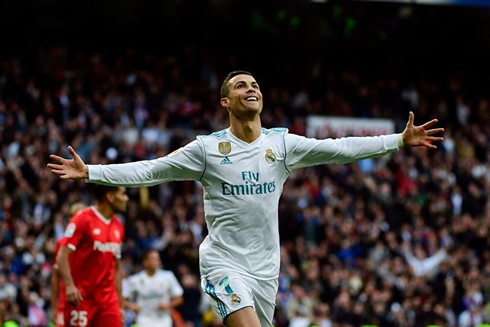 Five goals in a vintage first half from Real Madrid allowed the hosts to run over Sevilla at the Bernabéu and earn another 3 points to keep them on the fight for La Liga title. Ronaldo presented his 5th Ballon d'Or to the fans and celebrated it with his first brace in the league this season. Who was that team and what did they do with Real Madrid. 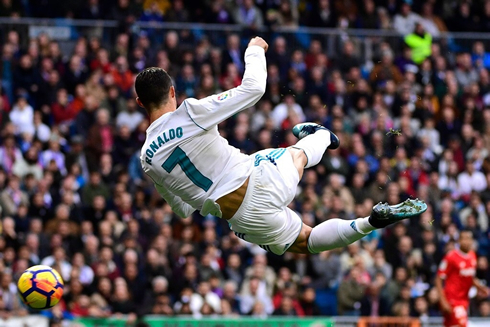 It was an electric performance at the Bernabéu, as Madrid romped to a 5-0 victory over Sevilla, who sat one spot higher in the table going into the match. Much of the discourse around this game will surround the successful lineup choices of Zinedine Zidane, who opted to leave Isco on the bench in favor of Asensio. Lucas Vasquez, fresh off his midweek winner vs Dortmund, started on the right and provided the kind of width and structure it seems Zidane was looking for today. And Madrid looked like they hit another gear. Wave after wave of attack hit the visitors, putting them under pressure early as Madrid toyed with them. 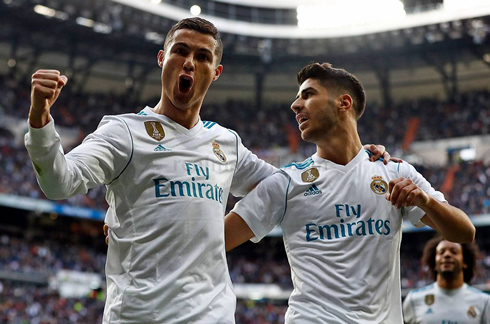 A great pass from Asensio to Ronaldo set him up for the second, a nice capper to a great week for Ronaldo, as he became the first player to score in every game in the group stage in the Champions League, locked up his 5th Ballon d'Or and scored a double today (he netted a penalty soon after his first goal). But Madrid weren't done, not just yet anyway. Toni Kroos showcased some surprising speed spriting with the ball before laying it off and receiving the return. As per usual, a calm finish from the German made it 4-0. And soon it was 5-0, as Achraf Hakimi finished off from a tight angle in the box after some excellent work from Benzema. The second half was a bit tamer, as Madrid took their foot off the gas. 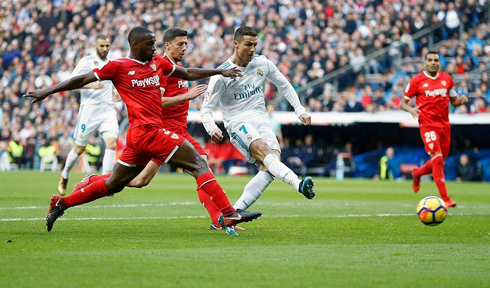 Benzema hit the post and Nacho and Vallejo proved that their partnership will only grow with more game time, as they stifled any Sevilla opportunities. It's a huge result for the club ahead of El Clasico and as Madrid head off to the Club World Cup, Zidane certainly has a lot to think about with regards to the squad selection for that game. Cristiano Ronaldo next game for Real Madrid is on December 13 of 2017 against Al Jazira. You can watch Juventus live stream, Real Madrid vs Al Jazira, Villarreal vs Barça, Man United vs Man City, Southampton vs Arsenal, and Liverpool vs Everton, all matches provided from our live soccer game pages.